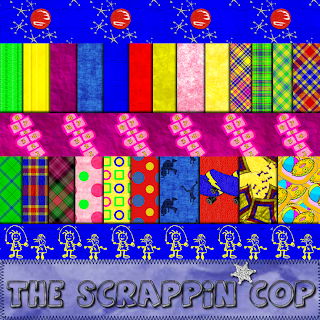 The Scrappin Cop: Summer Fun Patterns and Image Pack! Summer Fun Patterns and Image Pack! Well here are the patterns for the Summer Fun theme! As Aeryn commented on the elements, these would go well with the ADS Designers Backyard Playground Collab kit, which is fantastic! So many resources for your summer scrapping! This set includes the jacks, hopscotch, skateboards and kites, lots of plaids and some textured papers. These are CU friendly with a couple of restrictions (read TOU in download). I'm working on an overlay to post to go with the Summer Fun theme and then moving on! (No grass growing under my feet!) LOL. Per a special request, next will be fishing/camping and from there - who knows! link for .pat fixed 10/31/08 - Thanks 4shared for Destroying this file. link for image tiles fixed 11/01/08 - Thanks 4shared for Destroying this one too. Love the new patterns. Thanks for sharing your talents! Yes!!! Thank you, thank you. I can't wait to see the fishing and camping! We just got back from our camping trip and although the fish weren't biting, we still had lots of fun and I took lots of pics.